Bibimbap is one of those satisfying, all-in-one type dishes that once you have it, you want it again and again. I came across a recipe that made bibimbap into a homemade, healthier, vegetarian version. I have now made it about three times, with different veggies every time, and the result is always great. Below are some suggested variations on the recipes, and how to end up with a great dish. 1. Make sure your rice is cooked and slightly cooled. 2. For whichever variation you are using (or combination thereof), make sure all your ingredients are ready to go: Cut up your veggies. Precook your sweet potato and cauliflower. Cut up your tofu and allow it to drain a bit by placing it between paper towels with a heavy plate on top. 3. When everything is ready, it’s time to get cooking. Basically, you are going to cook an item, remove it from the pan and transfer it to a plate, add a new item to the skillet, and cook. At the end, you will throw in the rice and then add all the veggies back with it. Here we go. Onion and kale: Heat 1/2 to 1 tablespoon oil in the skillet over high heat. Add the onion and cook for about 3-4 minutes until beginning to soften. Add the kale. Continue cooking until the onion is fully cooked and the kale has wilted. Remove to a plate. Tofu/Protein, Garlic and Ginger: Heat 1/2 to 1 tablespoon oil in the skillet over medium-high heat. Add the garlic and ginger (if you are using) and cook for about a minute. Then, add the tofu (or other protein), and allow to brown on all sides as you stir around occasionally. When the tofu is almost cooked, add half the sweet soy sauce and the hoisin sauce (if you are using). Stir around, and remove to a plate. Shitake Mushrooms and Zucchini OR Cauliflower and Sweet Potato: Heat 1/2 to 1 tablespoon oil in the skillet over high heat. Add the shitake mushrooms or cauliflower and cook for about 5 minutes. Then, add your zucchini or sweet potato. If adding zucchini, cook until it is fully done, about 5 minutes. If adding sweet potato, gently mix with the cauliflower for about a minute. Remove to a plate. 4. Now it’s time for the rice and to bring it all together. First, add 1 tablespoon oil to the pan. Let it heat, and then add the rice. 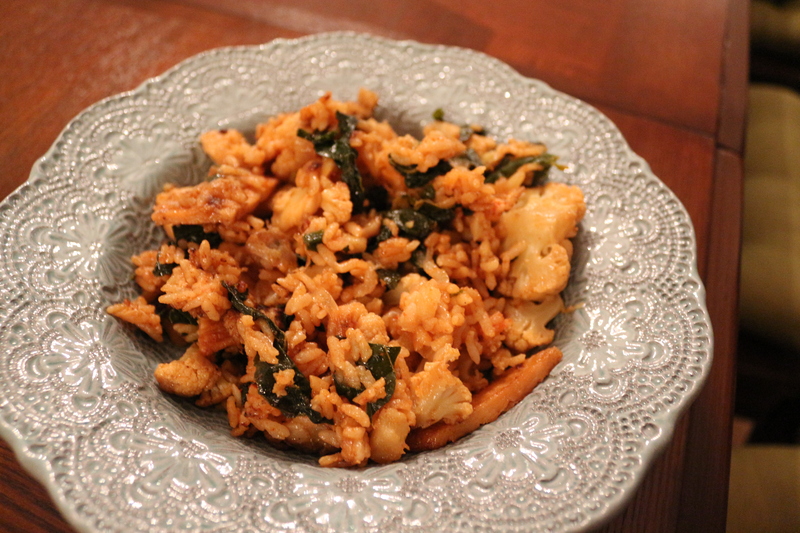 Spread the rice around the pan, and add the gochujang and the remaining sweet soy sauce. Mix well to incorporate. Add the veggies and protein back to the rice mixture and continue mixing well to incorporate and scraping the rice off the bottom of the pan. If you are using green onion, add it now. If you want to add egg to your fried rice, make a well in the center of the rice (so you can see the bottom of the skillet), pour the eggs into the hole, and allow to cook a minute or two before mixing to incorporate. Continue to cook the rice, and scrape the bottom of the pan, for about another 3-5 minutes. Then turn off the heat, scoop into a bowl, and enjoy! This entry was posted in Mains, Sides and tagged Asian foods, cauliflower, Gluten Free, Kale, MuSHrOOms, Potatoes, rice, SPICY, Tofu, Vegan. Bookmark the permalink.